“5+ Questions With” is a new series in which we learn more about Mass Poetry’s partners throughout the region, particularly those that are also members of the Poetry Coalition. This week we’re hearing from Jennifer Benka of the Academy of American Poets, which oversees the Poetry Coalition. Mass Poetry is a member of the Poetry Coalition. Tell us a little bit more about the Coalition – what was the history behind or the impetus for creating it? What kinds of organizations and programs does it support? I’d be happy to, and we’re thrilled to have Mass Poetry an active part of this new national alliance. The Poetry Coalition grew out of an informal conversation at the Associated Writers and Writing Programs conference in 2015. There, poetry leaders expressed interest in working in closer coordination, partnering to make poetry more visible, and being able to meet regularly. The Academy of American Poets soon after secured support from the Lannan Foundation to convene a meeting in November 2015 in Santa Fe, New Mexico where poetry leaders deepened knowledge of one another’s organizations, identified natural points of intersection, and discussed collaborative opportunities, including developing new nationwide programmatic strategies to positively contribute to public understanding of pressing social issues. We met again in November 2016, at Poets House, a poetry library and literary center in New York City, which volunteered the space. At this meeting, the formal structure of the Poetry Coalition was determined, including its mission, goals, and values. 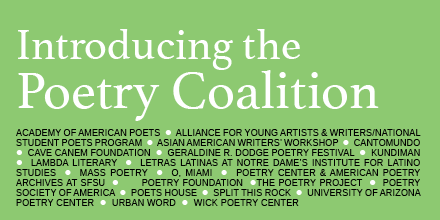 We agreed that the coalition would be an alliance of independent nonprofit organizations in multiple cities across the United States working together to promote the value poets bring to our culture and the important contribution poetry makes in the lives of people of all ages and backgrounds. Member organizations would share a primary mission to promote poets and poetry, and/or be multi-genre literary organizations that serve poets and readers of specific racial, ethnic, or gender identities and communities. While some organizations might publish poetry, core to all organizations is presenting poets at public events. There are 23 founding members and five affiliate members. Each March, we all offer programs on a shared socially relevant theme. In 2017 it was Poetry & Migration and in 2018, Poetry & the Body. You can learn more here. Tell us a bit about your organization’s (Academy of American Poets and the Poetry Coalition) engagement with poets and poetry, and why a relationship with Mass Poetry makes sense. The Academy of American Poets has served as the lead organizer, fundraiser, fiscal conduit, and administrator of the Poetry Coalition. This role is consistent with our composition and orientation. We were founded as a membership-based organization in 1934 and today are the nation’s largest such organization advocating for, presenting, publishing, encouraging the teaching of, and honoring the artistic excellence of poets through our publications and programs, which include Poets.org, a K-12 Education Program, American Poets magazine, and National Poetry Month, which we originated and continue to organize each April. We have more than eight decades of experience working with, responding to, and representing a constituency of supporters, and we are devoted to collaboration, which is one of our core values. 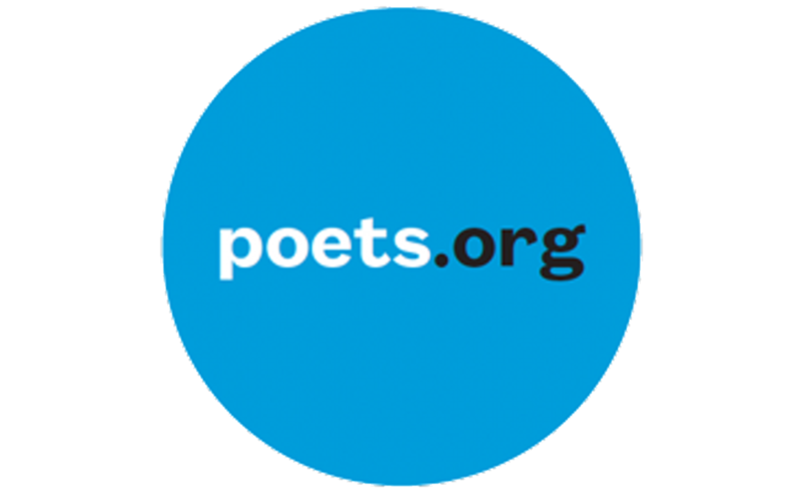 In addition to the Poetry Coalition, we presently deliver on this value in multiple other ways, including by engaging partner organizations to share their branded content on Poets.org, which is one of the world’s most visited sites for poetry. More on that here. We try to ensure that our large national reach and resources benefit smaller organizations as we believe that poets in the U.S. are best served by a wide spectrum of organizations in cities and regions across the country creating opportunities for them to present, publish, and archive their work. The Massachusetts Poetry Festival is a premiere festival not just in New England, but the country, attracting some of our nation’s most influential voices. On the U.S. poetry constellation, Mass Poetry is definitely a star. What is your personal relationship to poetry? Are you a reader, writer, educator? Poetry is what guides my life. I have published two collections of poems, Pinko (Hanging Loose Press, 2011) and A Box of Longing With Fifty Drawers (Soft Skull Press, 2005), and recently in Reading Queer: Poetry in a Time of Chaos (Anhinga Press, 2018), and Feminisms in Motion (AK Press, 2018). And I regularly write about and advocate for the important role poets and poetry occupy in our culture. I am also an active reader of it, in large part thanks to our Poem-a-Day series, which I hope folks know about. It’s free and the first place of publication for a new poem each weekday, sent to your inbox every morning and simultaneously published on Poets.org. More here. Speaking of Poem-a-Day, we had the privilege of publishing a very powerful poem by your new Executive Director Daniel Johnson, which I hope your readers and supporters might revisit here. How has your relationship with poetry changed because of your involvement with your organization and/or Mass Poetry? Honestly, I’m inspired by my Poetry Coalition colleagues. Almost all of us are poets devoted to our own writing practice but working daily in service to other poets and readers. I think artists who are able to strike that balance are very rare and I’m in awe of the generosity and big-heartedness of my peers. I believe part of why poetry is thriving in the U.S. today is because there is a hard-working, multi-city squad of advocates for the art form. You can read our joint statement about the exciting increase in the readership of poetry here. Do you have any big programs or events coming up that you would like to promote? Thanks! A few things… for the first time ever, we are inviting students in the United States who are in grades 9 through 12 to enter artwork to be considered for the official April 2019 National Poetry Month poster. And, for the teachers you reach, we are offering free award-winning educational resources including Teach This Poem, a glossary of poetry terms, essays about teaching, and lesson plans, which have been reviewed by our educator in residence, Cambridge’s own Dr. Mady Holzer, with an eye toward developing skills of perception and imagination.